It's must-win Wednesday for these two teams. Missouri (9-5; KenPom: 93; NET: 85) returns home with an 0-2 start to conference play, while Alabama (10-5) squandered an 11-point halftime lead in their loss to Texas A&M, dropping to 1-2 in conference play. Game time is 8 P.M. CT. SEC Network will televise the game. My Two Cents: Even though I felt confident that Alabama would win when I posted my previous game preview, by Saturday morning I was texting a buddy of mine that I had a bad feeling about the game. The reason being that the only consistent thing we've seen from this program in the better part of the last 25 years is inconsistency. I've lost count of how many times over the years, now decades, that I've felt the team was moving in the right direction, only to watch them lay an egg that halted the momentum they had built. That was, once again, the case on Saturday. Not that it lays waste to the season, but it is a gut punch to the fanbase to see two almost similar losses take place (Georgia State and Texas A&M) in Coleman within the same season. Even more difficult was the Saturday loss because a great crowd turned out to cheer on the team. I know I sound like a broken record, but you don't have to win every game to move a program forward, but you do have to take advantage when the momentum and fan interest is in your corner. You can't play great to beat Kentucky, only to drop two straight after that and expect to build any momentum within the fanbase. And so here Alabama is again, in a similar position to where they were at following the Georgia State game. The team did respond to that loss with a five-game winning streak. It's probably too much to expect that kind of success with the schedule that Alabama has on tap, but they do need to get over the loss on Saturday quickly because how Alabama handles the next six games, which is the toughest stretch of the season in my opinion, will likely go a long way in determining their season. Missouri is once again trying to overcome the injury to a key player. Last season, it was Michael Porter Jr. that was injured three minutes into their season opener. This season, it was Jontay Porter with an injured knee before the season even began. While Michael Porter Jr. returned for the postseason, Jontay has been ruled out for the entire season. Despite the loss of Porter, Missouri had a solid non-conference run, beating the likes of Oregon State, UCF, Xavier and Illinois to go 9-3. Unfortunately, they had to open their conference schedule with the league's best team in Tennessee, and then had to travel to play a suddenly hot South Carolina team. It could be argued fairly their 0-2 start is more a product of their schedule and less a reflection of how good or bad their team is. Regardless, with road trips to A&M and Arkansas looming, this is a very important game for the Tigers. I expect them to be ready to play. The first thing that stands out when looking at Missouri's stats is that they are a very good 3-point shooting team. They are ranked 16th in the country in 3-point pct at 39.4%. Their numbers aren't great inside the three-point line, making just 46.2% of their 2-point shots (ranked 289 at KenPom). That's a complete flip from what Alabama saw Saturday with an A&M team that was bad from three, but scored at a high rate in the paint (and boy, was that ever the truth in that second half on Saturday). I'll be interested to see if the Missouri coaching staff tries to do something different and get the ball in the paint after watching how effective A&M was on Saturday. Not only does Missouri shoot the ball well, but they take a lot of 3-point shots. 41.7% of their shot attempts are from three. This is concerning because Alabama has not defended the three well. Opponents are making 35% of their 3-point shots (ranked 225 at KenPom). Needless to say, Alabama's perimeter defense must be better on Wednesday night. Alabama must control the glass in this game. Believe it or not, Missouri is another good rebounding team on the schedule. The Tigers are ranked 69th at KenPom in offensive rebound pct. (32.1%). There is nothing more dangerous than a good 3-point shooting team that also rebounds the ball well on the offensive end because the best 3-point shots are typically considered to be those that come off offensive rebounds when the ball is kicked out before the defense can reset. If Alabama can hold Missouri to the national offensive rebound pct. average (28.7%) or lower, the chances of a road win rise significantly . Missouri is ranked 292 at KenPom in turnover pct at 21.2%. A&M was ranked 249 entering Saturday's game, and only turned the ball over three times. Alabama only forced one steal in that game. And I don't think it's because A&M was that good. I would echo DJC's observation in his recap that the coaching staff never extended the defense to put more pressure on the ball, and that had more to do with A&M's low turnover rate. Alabama opponents are only averaging a turnover pct of 17.4%; the national average is 19.1%. Keep an eye on the turnover stats for Missouri on Wednesday. If they're low, I think the chances are slim Alabama gets the road win. Players to Watch: It may not have altered the final score of the game, but Herb Jones only playing 11 minutes on Saturday had a crucial impact on the game. For one thing, without Herb's defensive presence in the paint, A&M feasted around the rim. As DJC pointed out in his recap, there were things the coaching staff could have done to make up for this, but at the very least, having him available at the end of the game guarding Starks on the final shot would have likely increased Bama's chances of escaping with the win. It was really the first time this season, for me anyway, where the value of Herb to this team came into clear focus. Missouri's three-point shooting is obviously a concern, but after watching A&M's Josh Nebo look like Patrick Ewing (yeah, I know I'm dating myself) on Saturday, I'm concerned about the impact that 6'10, 252 lb Jeremiah Tilmon may have on this game. I would argue that Tilmon is a much better player than Nebo has been over the course of the season so I'd be surprised if the Missouri coaching staff doesn't try and get Tilmon involved early. His numbers for the season: 10.2 ppg, 6.2 rpg, 55.1% FG. 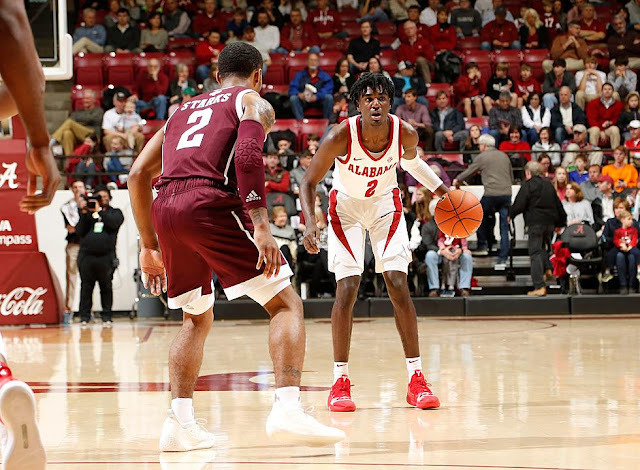 Tilmon is prone to foul trouble (an astounding 6.67 fouls committed per 40 minutes) so it wouldn't be a bad idea for Alabama to go at him early to force him to defend without fouling. Prediction: As I mentioned at the top, this is a big game for both teams. Alabama is trying to avoid a third straight loss on the heels of their big win over Kentucky, while Missouri is trying to avoid an 0-3 start in league play. Alabama is 3-1 vs Missouri during Avery's tenure, but due to schedule quirks, only one of those games was at Missouri (a 57-54 win for Alabama). Alabama is arguably the more talented team, but Missouri has the home court advantage. Alabama has been mediocre on the defensive end, and mediocre defensive teams typically don't fare well on the road. On paper, this looks like a coin flip game. This feels like a desperation pick on my part, but I'm going to predict our guys show some resiliency and bounce back for a much-needed win.